The problem with horror movies for me, is the ultimate resolution of the horror. The cause of horror is never as scary, and worse, triggers the left side of my brain and I am left shaking my head at the implausibility of it all. 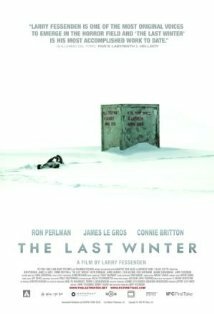 The Last Winter pulls a bit of the same with its supernatural themed resolution and the ever-present reminder of eco-activism. Overlooking these however, makes the movie a slow, but absorbing tale of creepy, incessant mishaps on a drilling base in the wilderness of Alaska. There is something about the white flat landscape of the arctic circle that make it a perfect locale for things to go wrong. And in the movie they do, starting from an innocuous bloody nose during touch-football to the eventual onslaught on the phantom culprits. Ed Pollack (Ron Pearlman) is the gruff taskmaster that heads a drilling crew deep in Alaska. To his eternal disdain, the crew also includes an environmentalist (James LeGros), who is concerned that all is not well with the operation. When a crew member begins acting strangely and is discovered outside, frozen to death, the clock begins to tick on a series of unexplained accidents. As the toll begins to mount, survival becomes the only goal. The movie is glacially slow as it begins, but in time the narratives picks up enough to be involving if not gripping. Cinematography follows a similarly lazy approach, and the director does not always use the white expanse as a fellow cast member (like say in Fargo). That said, there is something enticing about a horror movie that does not follow the usual set pieces. And moreover, it is a supernatural thriller set beyond the Arctic circle. If that does not interest you, and it should, then this movie is probably not something you want to spend your time on.